Retro gamers may have had their eyes turned recently by Rock 'N Racing Off Road, which perhaps brings to mind the classic arcade title Super Off-Road. This top-down racing approach is fairly popular in real-life mini-toy car versions at the moment - with toys controllable via smartphones or tablets - and EnjoyUp Games is clearly hoping to catch the vibe for a Wii U eShop sales success. The Spanish developer has now confirmed that the racing title will hit the Wii U eShop in both North America and Europe next week, on 29th January; it'll cost €5.99 / $5.99. Key features are local multiplayer, naturally, along with a variety of modes and tracks. There's a trailer for this one below, so check it out and let us know if you're tempted to rev up for its release. But do they slide at all!?! I loved the Super Off Road, and have played Slick and Slide for years, and while graphically this looks perfect, the gameplay seems slow and sticky. Oh man, I loved both Super off road and Slicks 'n' slide and this reminds me of both. Sweet 90's. I agree that the gameplay looks too slow. Super Off Road wasn't much faster, but the tracks were so tight and bumpy that the tempo of the action was high. 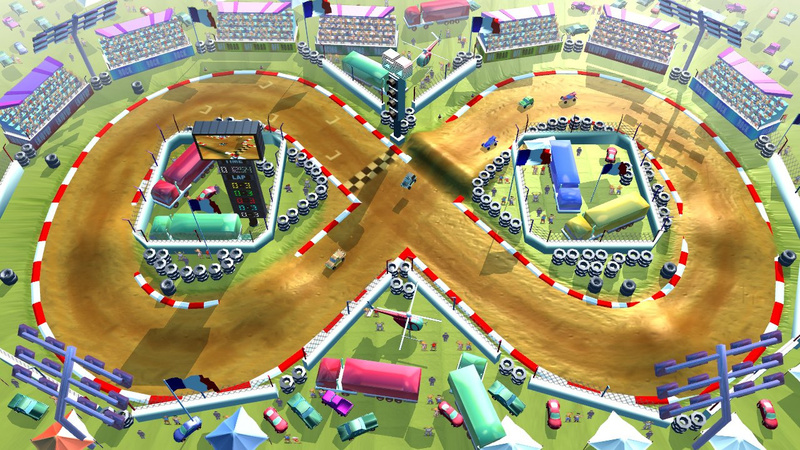 This looks like a poor man's Super Skidmarks (a game in which you could drive novelty cows and tow caravans). I didn't realise this would be coming so soon after last weeks announcement.I used to love these kind of games and look forward to seeing how this turns out.Fingers crossed they get the gameplay right and have a decent amount of tracks and variety in the arenas.Though from the video above I have my doubts about both. Looks fun. Hope it controls well. I had Super Off Road on the NES. Loved it. May have to check this out. @Bosh_Factory You have had me watching videos of Super Skidmarks on Youtube with a big smile on my face,I had completely forgotten about that game.Cheers fellow Brutal Deluxe fan From the Speccy to the Megadrive years,if a game had Codemasters on the box I didn't usually even need to read a review.It's a shame we likely wont ever see titles like that on the Eshop! This looks like a rather nice game, I really like racing games! Yes that includes MK8 and I have it. Just Smash bros has been taking up my time lately. Either way, I will consider this game, but I would probably look out for review first. I would've appreciated more original track design - I think I can recognize most if not all to be from Super Off-Road. Had so much fun playing the original in the 90" I'm definitely picking this one up when it releases on the eshop. Ok, Mike Williams is now on my list. Ivan Ironman Stewart's Off Road Challenge (NES) is one of my all time favorite games. I bought Driift mania on the Wii eShop a few years back as it has been the closest thing to it in recent years. The original game featured small circuit off road racing for upgrades to performance (Suspension, Engine, Tires, NOS) or simply cash. I spent many hours of my childhood sneaking over to my cousins house to play that game. For the price I will probably pick this up. Graphically it looks great, the only thing that could ruin it would be bad controls. @Pahvi It's a Spanish developer so Brazil would be Brasil. It might get updated in the English localization, but probably not. Might as well have been developed by Konami, right? Wasn't there a Rock N Roll Racing back in the day? Is this essentially a remake? Every time I see the title of this game one the web, I read it as "Rock n' Roll Racing"
... then I start hearing things in my head like, "Jake JAMS into first!" "Snake looks lost out there!" "Rip is in another timezone!!!" (EDIT) @MeloMan — you must have been reading my mind as I made this post. @MeloMan This is essentially aping the name and trying to appeal to our nostalgia. THIS is the kind of game I expected TNT Racers (or whatever) to be. Much better. I'll buy. @turnmebackwards: Man the SNES Super Off Road was the best version. I love that it even included the Toyota jingle at the time in the sound track lol. Still one of my favorite sound tracks on the SNES. Looks like great multiplayer fun! Will definitely get! Hi! Thanks for your comments! I hope you like and enjoy it! I love the announcer, but providing an overhead view of the entire course like that just makes the racers too tiny. I hope I'm very wrong about everything I'm about to say, but if this game is trying to revive the racing style of Super Off-Road they are missing crucial elements such as earning Cash based on your placement in a race and using it to purchase vehicle upgrades like Engine, Tires, Acceleration, and Nitro. Speaking of Nitro---where's the Nitro?! Something as simple as adding Nitro could make this game take off, but I can't see any visuals in the trailer that indicates it's present. It's so disappointing to see somebody get so close to producing something that was done right in 1989, but can't quite get it right in 2015.